We make high quality clothing from natural materials. 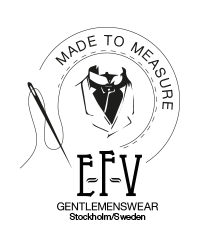 We want to make our customers proud E-F-V wearers which is why we pay close attention to every detail. The clothing is tailored after your measurements and specifications by our experienced staff. You can choose fabrics from several of the best mills in the world. Buy your package of 1, 3 or 5 shirts in our shop. Get an appointment to come to our showroom or to one of the trunk shows we will be doing in several cities around Europe. You will get measured for a garment of your choice, where attention is paid to posture, differing body types etc. The program we work with is as close you will get to a bespoke experience without paying bespoke prices (and is actually better than a lot of the bespoke services we’ve encountered). You get to choose between several different styling options when it comes to fabrics, collars, cuffs. monogram etc. Send us an inquire at info@e-f-v.com or write us a line here.